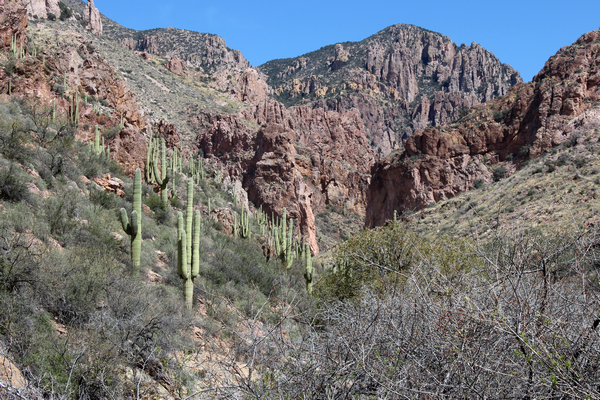 The Galiuro Mountains are a mountain range in southeastern Arizona. Situated between the Catalina Mountains and the Graham Mountains, the Galiuros are best known for their rugged terrain and wilderness character. 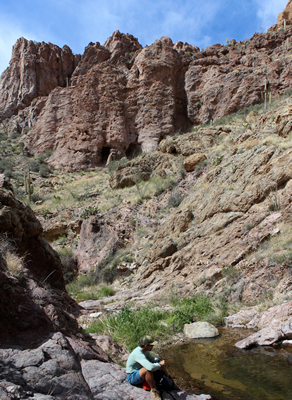 Kielberg Canyon is a major westside drainage that empties into the San Pedro River near San Manuel. It is named after Emil Kielberg, a Danish prospector and farmer who was in the area in the very early 1900's. Public access to the roads and trails of the westside Galiuro Mountains can be difficult. 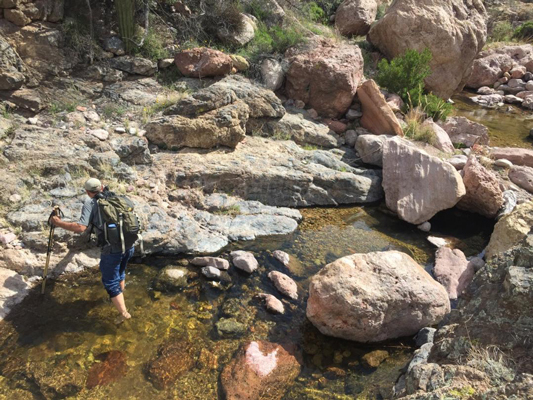 Fortunately, the family who ranches the north side of Kielberg Canyon has an agreement with the Arizona Game and Fish Department to allow sportsman access. That access allowed us to drive on a ranch road 5 or 6 miles toward the mountains to a location on the rim where a steel waterline comes out of the canyon. An old abandoned road that is alongside the water line served as our hiking trail down the steep hillside to the bottom.. 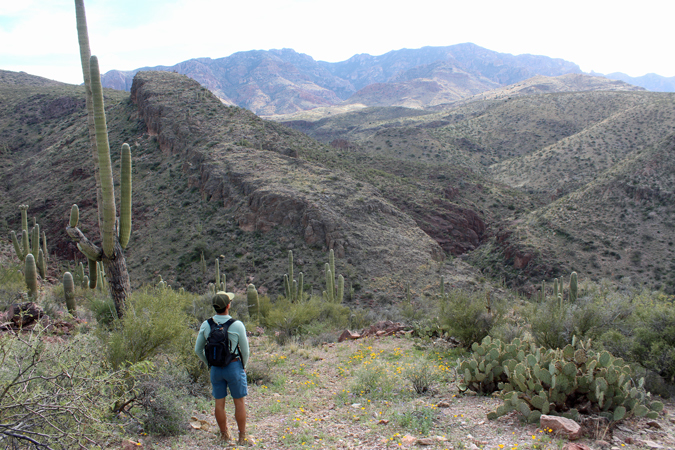 The photo above is the view into Kielberg Canyon taken from that old trail. The canyon floor is about 500' lower in elevation than the rim. Our plan was to use the canyon as the route to a location identified as Geronimo Camp on an 1930's era topo map. This map is older than the access road and trail that we used. If drawn on the map, the road would be shown on the north rim of the canyon ending at the National Forest Boundary in section 8. Newer maps show the road and a water tank in the bottom of the canyon. The road across the canyon that ends at the Sixteen to One Mine has been gated and locked several miles to the south of this map section. This concrete water tank was the beginning of our walk up Kielberg Canyon. It was a short walk. Just ahead beyond the corner, was a narrows filled with water that we could not negotiate. It was necessary to backtrack and bypass the spot on the right. An old trail can be seen in the photo making its turn around the ridgeline above the narrow section. In Mid-March there were quite a few wildflowers. This is the view down the canyon from the concrete tank towards the Catalina Mountains. After a short distance on the bypass trail, we were able to return to the canyon floor. The question in the back of our minds was how many more times would detours such as this be necessary? There were many saguaros on the hillsides. A nice crested saguaro was spotted in the cactus forest. Water flow in the canyon is not perennial. We encountered several checkdams constructed to capture some of the run-off. The terrain in the canyon bottom varied greatly. There were stretches that were open with few obstacles. And then there were sections in which the bottom was cluttered with boulders and "stickery" bushes. Those sections were more of a challenge. The Spring runoff affected our travel. Fortunately, I only had to shed my boots one time. It was also our good luck that no detour like that at the beginning of the walk was required. The rocks of the canyon were very colorful and in interesting formations. The geology, plant growth, and water all combined for many spectacular canyon scenes. This is the view looking east on up into Kielberg Canyon near where we needed to turn north out of the canyon towards Coronado Camp. By the time that we arrived here, it was obvious that we did not have the time to continue on to that destination. But rather than just reverse our direction, we decided to exit to the south and return along the south rim. Instead of an "In and Out" trip, the adventure morphed into a loop. Our exit was through the side canyon that is the location of the old 16 to 1 mine. The phrase "16 to 1" comes from an old ratio that was once used to equate the number of ounces of silver that it would take to equal the value of one ounce of gold. The silver mine was owned by Emil Kielberg in the early 1900's. There is no real record of there having been much production from the mine. These mine workings are near the canyon rim. There were others lower on the hillside. We did not have time to look around. This view is from the 16 to 1 Mine Canyon to the north across Kielberg Canyon. The low saddle on the skyline is the location marked on the early topo map as Coronado Camp. Our choice of that camp as a destination for a daytrip up through Kielberg Canyon had not been very realistic. Once on the rim, we knew that we were on a parcel of private property and did not want to be perceived as trespassing. This sign was a relief to see. 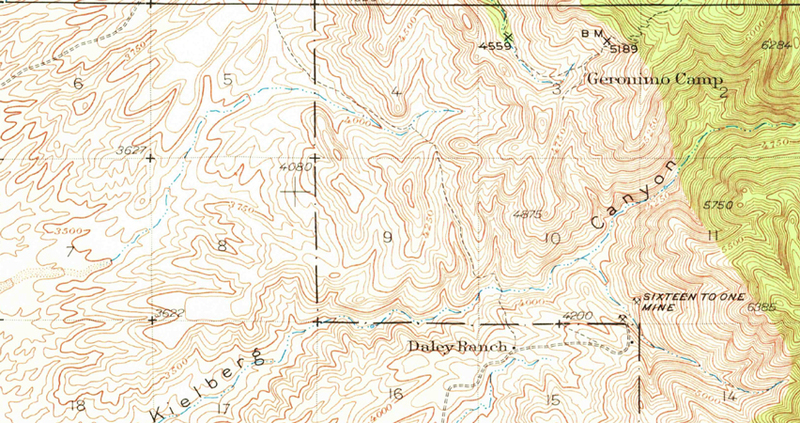 The old 16 to 1 mine road provided our path down to the area identified on the topo map as The Daley Ranch. Where the road turned south, we continued west along the rim. Just upstream from the narrow section of the canyon that we had bypassed earlier in the day, an open ridge directed us down into Kielberg. My son in law found a complete set of deer antlers along this leg of the trip. Back at the concrete water tank, this critter was seen in the grass. It looked to be very healthy. We returned to our truck by the way of the old waterline road. The cold drinks in our ice chest were much appreciated after the steep climb out of the canyon. We were somewhat disappointed that we had not reached our destination on this trip, but the scenery down in the canyon and the exercise from the walk more than made up for those feelings. We have not written off getting to Coronado Camp. The trail shown on the topo map that comes from the north is in an area controlled by a different rancher. His property is open seasonally for several hunting seasons. We will just have to catch one of those and try again.